As I start writing this, I’ve been unemployed for about eight hours. Yesterday was my last proper work day in Iron Sky. That job was quite an awesome adventure and worth a short retrospective. I started the job in the January 2010, and the job started with a bang by a trip to Germany where we went to visit the art department, did some location scouting around Frankfurt and met with some of the actors in costume fitting and casting sessions. Because I’m a big fan of urban exploration, the recce trips were especially awesome for me, and really atmospheric. I especially remember this one morning, when we got up early and crammed ourselves into the recce van. The sun was just rising, there was snow on the ground, we were driving through the sleeping Frankfurt and I was listening to Fever Ray‘s Concrete Walls on my mp3-player. It was one of those atmospheric, beautiful moments that just stick with you. A bit later there was another trip to Germany, this time to Berlin where we took part in the Berlinale film festival, and where we arranged an impromptu fan meeting in this awesome hackerspace / nightclub called c-base. It was an insanely neat place to visit, the club is built to resemble a space station from some 80’s sci-fi flick. The next really interesting step was our visit in Cannes Film Festival in the end of May. We published our second teaser there, and got some really mad publicity all around the net and in the traditional media also. I also had a fan boyish brush with fame when Terry Gilliam dropped in to our office in the Grand hotel, lured in by the name of the other production company, Fisher King. We were also interviewed by Mark Kermode. Mostly I spent my days in the production office before taking an unhurried walk back to our accommodation which was on the outskirts of Cannes downtown. In the beginning of June I got quite a surprise – I heard that I’d be going to Australia with two weeks notice. Our producer had found new partners for the project, and due to the weirdness of film financing it make sense to drag half of the production literally to the other side of the planet. Our first trip to Australia included some casting and planning sessions, doing some recce, and luckily also some free time which we spent doing the touristy thing. The trip concluded with us attending Supanova, which was this big scifi con where we had a booth of our own. The summer was full of hard work, and certain things looked a bit uncertain, which made the situation a little bit tense. 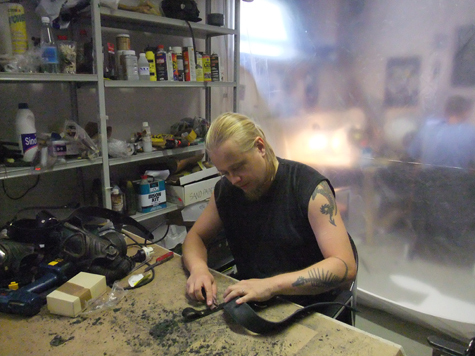 I found an excellent way to relax while being useful for the project at the same time: I went to work part-time in the Iron Sky costume department, assembling costume props and sanding a hell lot of leather. It’s great to see stuff on the screen I know I’ve built or worked on – such as the trooper backpacks, some of the gas masks, and the school kid uniforms. Then, finally, it was the time to start shooting the movie for real. First there was one month of shooting in Frankfurt, then a short Christmas break and one month of shooting in Australia. What can I say about that time, except that it was simply bloody awesome. I spent two months living out of one suitcase, seeing first hand how a multi million euro sci-fi film is shot. Because I was filming the behind the scenes stuff, I was actually required to go everywhere and film everything that happened. There were adventures a-plenty. In Germany there were snowstorms and unfortunate encounters with the authorities, in Australia there were cyclones, floods and thunderstorms, a lot of diving, massive studios, insanely cool sets… The shoot was really an once in a lifetime experience, which I wouldn’t have missed for the world. Compared to 2010, 2011 was pretty tame. There was only one major trip for me, an another trip to Cannes Film Festival, where we once again published a new teaser and the release date of the film. After that people have been insanely busy with post-production, Iron Sky comics and all the other assorted stuff that goes into making the most expensive movie this country has seen using experimental funding methods. In the end I can’t say the Iron Sky gig is the weirdest or most interesting thing I’ve done, but it certainly was the weirdest and most interesting job I’ve held, hands down. A huge thank you for everybody involved! So, what now? Well, I had one job interview today and I’ll have another one on Thursday, plus there are a few other interesting opportunities down the road. Overall I’m feeling weird, but it’s good kind of weird. For the first time ever I don’t have a plan, no direction to run to, nothing I want to scrabble to or away from or out of – and it actually feels pretty damn good. I guess this heralds an overall bigger change in my life. I’ve been pushing myself too hard for so many years that I guess it’s the time to slow down a bit before I break anything permanently. Last year saw me settle quite a lot of hard issues, and now I’m starting a new year with a clean palate, so to say. I see some lifestyle changes in the near future, as well as creating art. A whole lot of art. 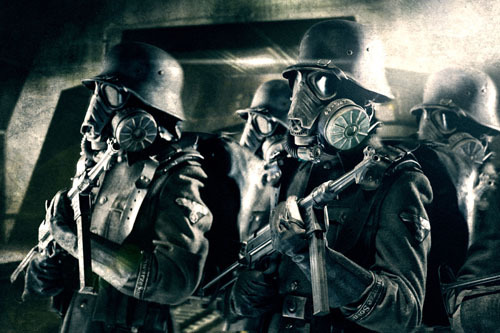 HI I am looking to find what was used for the vents at the bottom of the moon nazi masks. I am making one for a friend but cant find whatever it is.